November | 2013 | Every good thing…. A quick update on the day before Turkey Day. Moved our 7’6″ tender today. It came with the Genji and I had just rowed it down to the Clew’s slip to keep it until we got around to moving it. Well the move happened today. 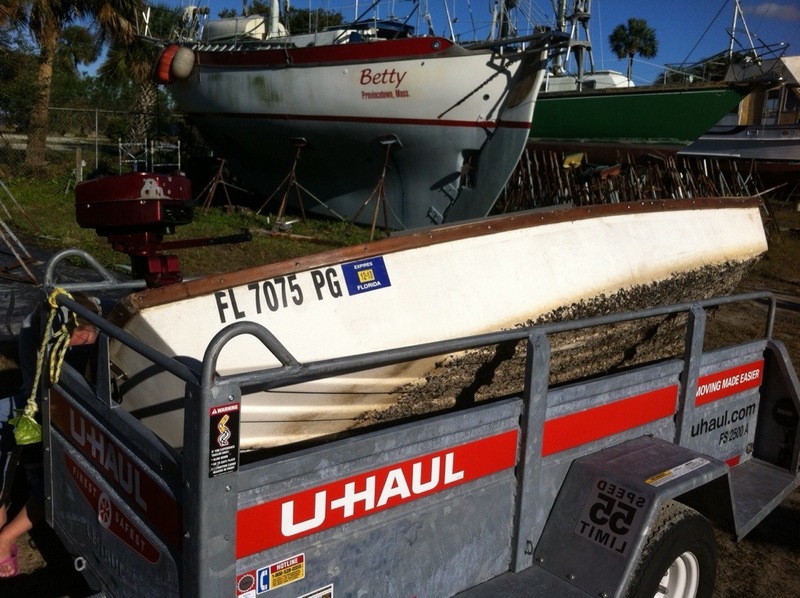 Lori and I went to our favorite UHaul store and rented an $15 trailer to tow the ding from the boat ramp to the Genji, where she now sits. It went pretty smooth as I had ordered a set of oar locks on Amazon a few weeks ago. 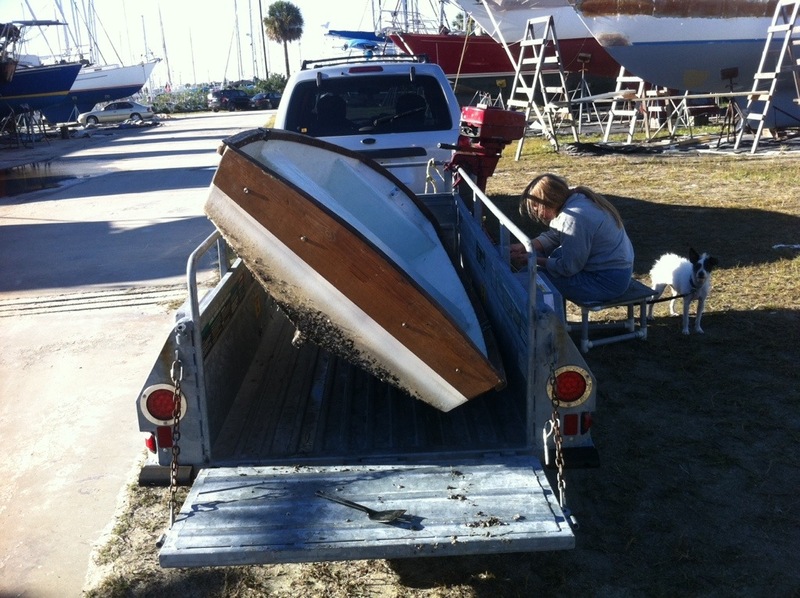 I just rowed it down to the boat ramp about 300 feet from our slip and we loaded her on the trailer. We got out a few spatulas and made an attempt at the barnacles but have concluded we need a stouter scraper. 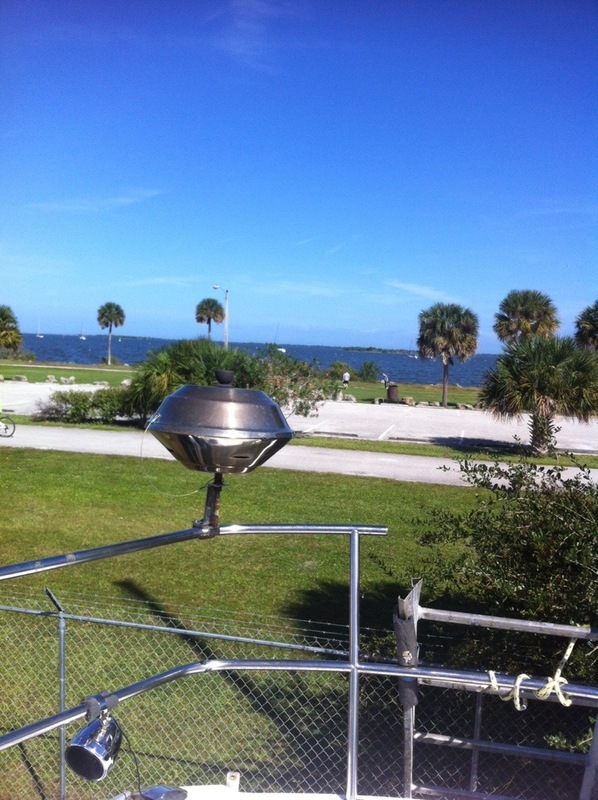 Lori did get the Outboard cleaned up nice. 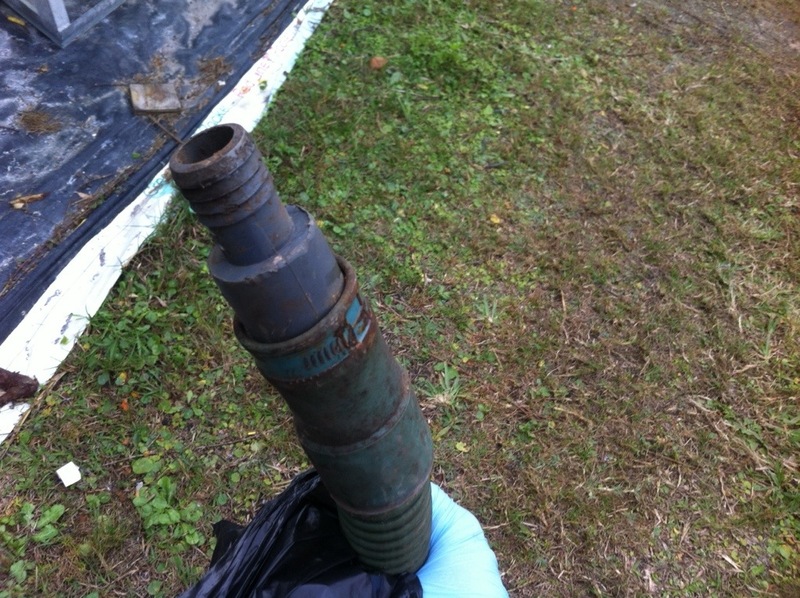 It is a Sears and Robuck outboard, age, old. We are still on the hunt for a flex plate for our W13. The above PDF is the part I need. If anyone has one……………. Delayed on account of… Wind. 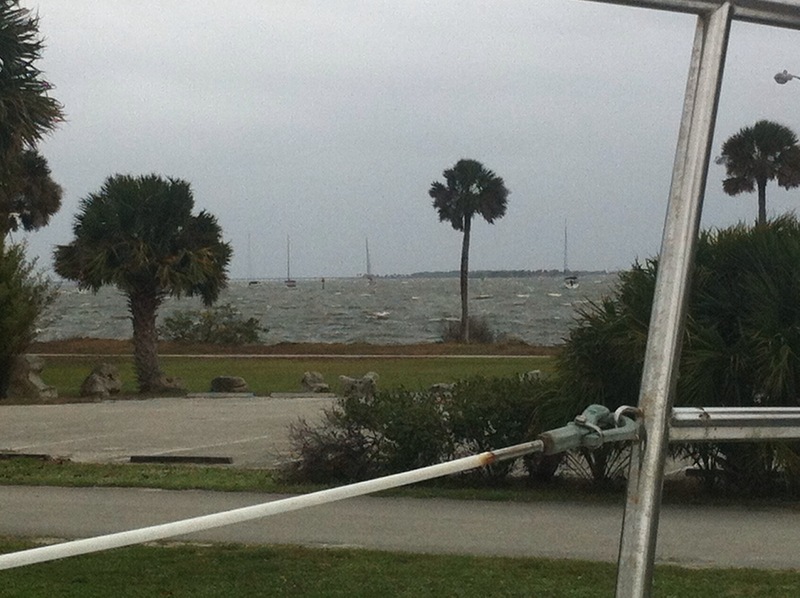 We are taking a break now as the wind is howling outside with whitecaps on the Indian river that are splashing over the sea wall. Not the best conditions to paint in. Yesterday, as Lori was on top sanding in prep for paint I endeavored to remover the old waste system. 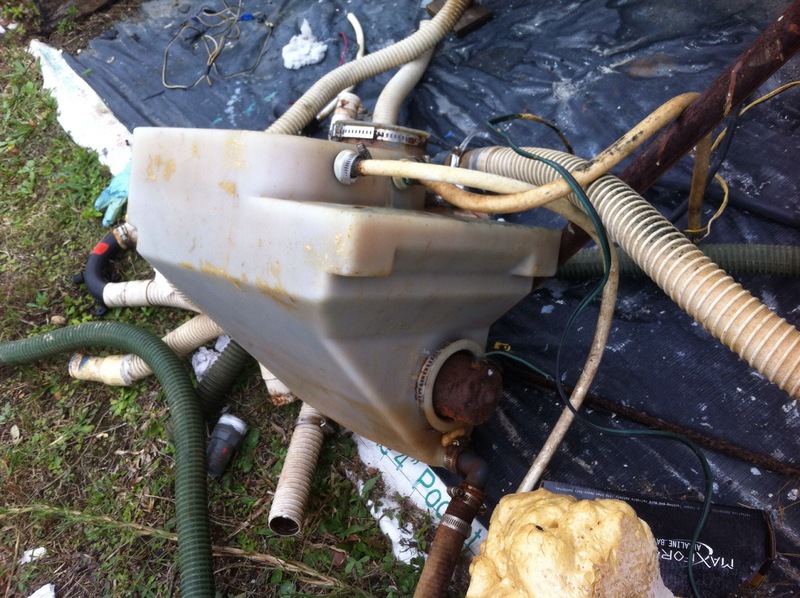 It turns out I was correct in that the treatment system had the pump integrated into the bottom of the tank. A bit strange as they did not design a way to access and maintain said pump. You can see the pump at the bottom of the tank in the above picture. Removing the tank was quite a bit of work. I had to drain the fresh water tank and remove it to get access to the poo tank. 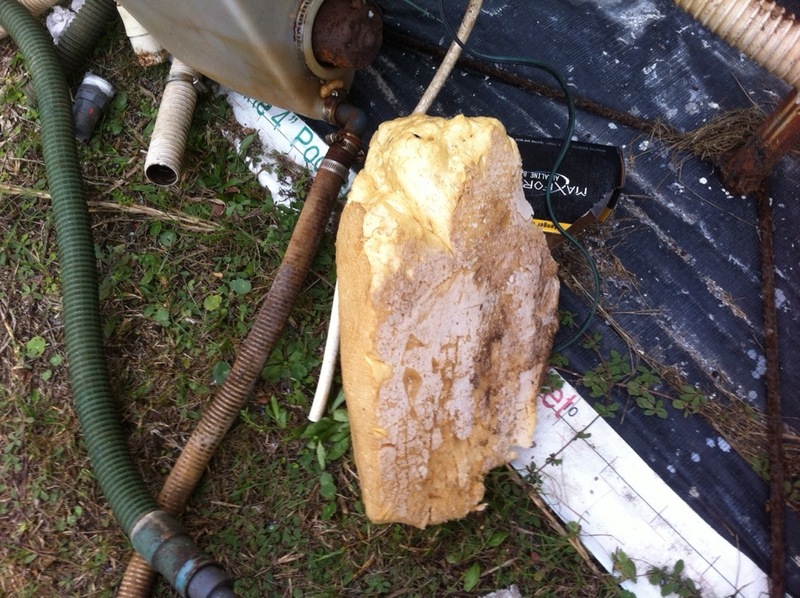 The poo holding tank was glued in using spay in foam, pictured below. I had the break the foam up and cut all the wires and hoses to the holding tank. 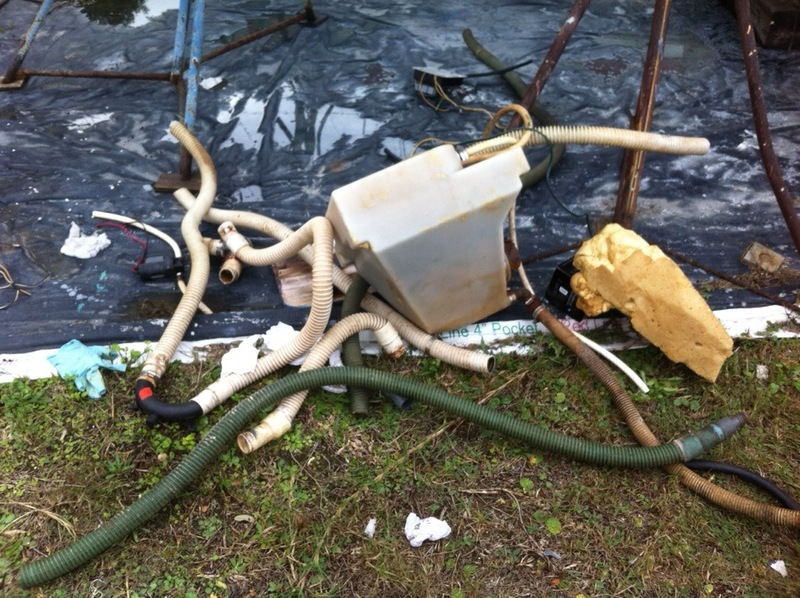 When I cut the chemical treatment hose a bit of leftover flowed out filling the boat who’s what smelled like a noxious chlorine gas. 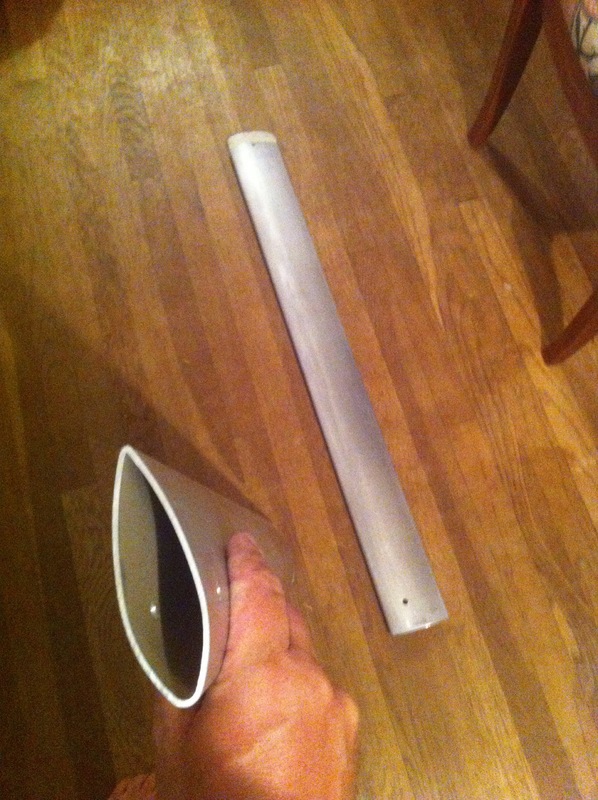 It took quite a bit of ventilation with a fan to get to the point I could hold my breath and pull the tank. 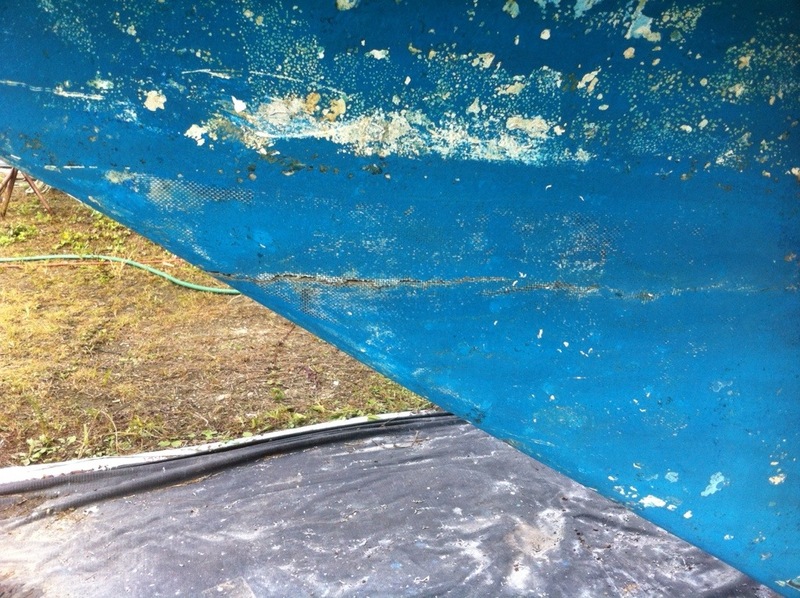 After which I hosed out the space under the vberth with fresh water. As I removed all the accompanying hoses and fittings I found that one of the couplings was incorrect if that it acted as a choke on the output. 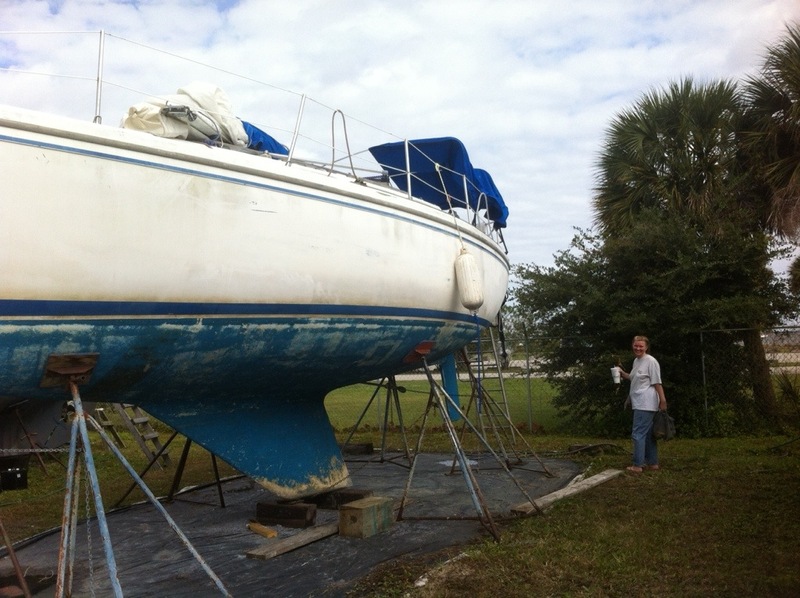 While I worked away on the poo issues Lori was busy prepping and started to paint topside. We now have the first coat applied from the cockpit forward and like the way it looks. 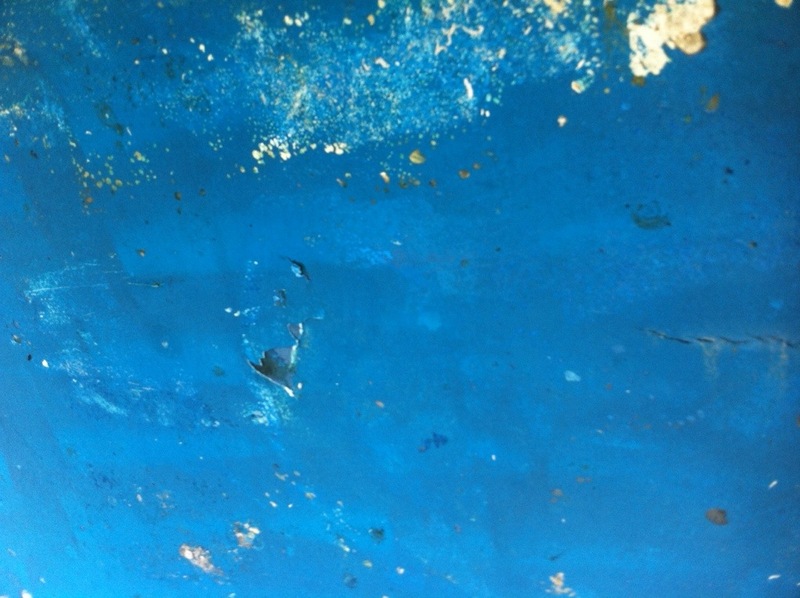 Safely we will not be able to get a second coat and prime the aft section of the boat as planned due to heavy wind. Tonight I got home from work and gave Lori a kiss. I had just had my hair cut down at the barber shop and the resulting scalp itch made me head straight for the shower. While I was bathing I heard Charlie start to bark. Surely there was a cat in the front yard. When I returned to the living room learned from Lori that the UPS man had put a package on the porch. Sure enough the package was from Catalina Yachts. Our new spreaders. Less then a week after requesting them I have them I’m my little hands. They need a coat of paint, pretty neat. I don’t know if the brackets to attach it to the mast are compatible. We may have to order some new brackets. Life is full of Priorities. We each have to decide were our lay. I intentionally try to keep this blog free of lifes priorities. I like to think of it as we do the boat, an escape from life’s grind. In roughly eight years and nine months we plan to throw off the lines and travel at least during summer vacation to not to distant Caribbean shores. In about 12 to 15 years we hope to go farther afield, either in the Bell or our next boat. Time will tell. Two other blogs that have caught my attention. And another of a couple that I find very remarkable.. Check them out, SV Seeker is a story worth following. Here I try to outline a Budget in Boat Units. Of course the issue is that we have just now started to do the yard work. Also not the lack of a Sails category. Those would be 3.5bu but at the moment we may just suffer with the old ones we have depending on what the sail loft fellow says. Joined the United States Power Squadron today. I enrolled in the boater safety course for $40 and received a 6 month membership. 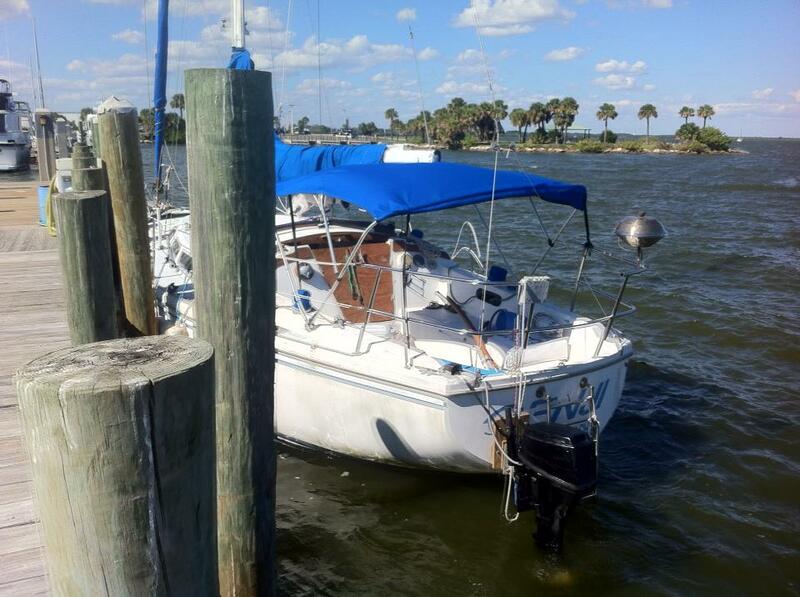 Not a bad deal at all as I plan on switching from SeaTow to TowBoatUS. Towboat US gives USPS members a 50% discount on their annual fee. I actually save $30 and come away with a boating safety course under my belt that helps with insurance. Another bonus is I will be able to fly the ensign on my starboard spreader. Getting a little geeked out I guess. Ordered a set of aluminum spreaders from Catalina Yachts. At $285 for the set and cast end caps they offered the best price I could find. The fact that they are the factory is an added bonus, the odd thing is communication with the parts department seems a bit lax by email, left a Voicemail and never got a call back. My guess is they are primary set up to sell to dealers but as long as I get my spreaders I can over look it. After a good night sleep Charlie had me up at 6am Sunday for his morning constitutional. After which we returned to the boat and I enjoyed some coffee as we waited for the dew to dry off the boat. Charlie wanted to go topside but for fear of dirty paw prints was confined below. 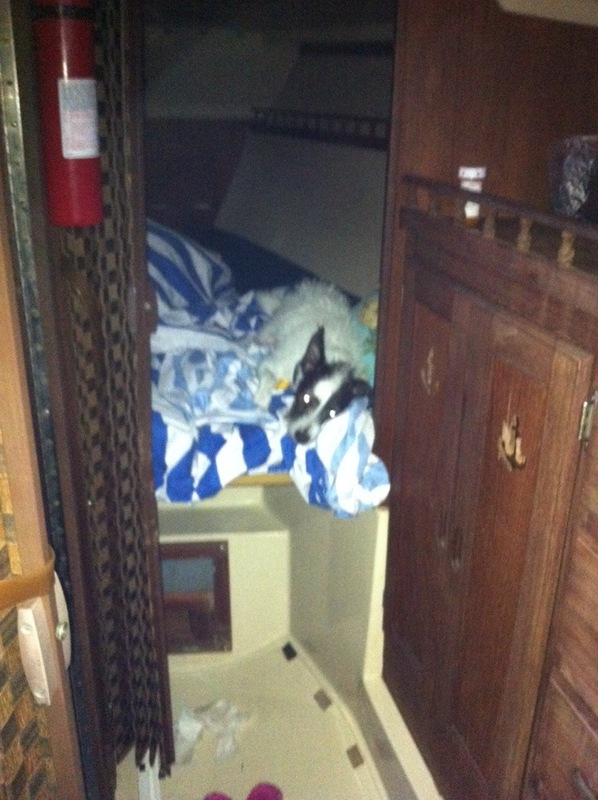 He took to pouting about the restriction in the vberth. The view from the back porch is pretty nice. I will have to make a point to catch the sunrise on our next visit. You can see the ladder tied to the stern pulpit. It is a nine foot drop from the deck to the ground. Also note the charcoal grill off of the Clew. 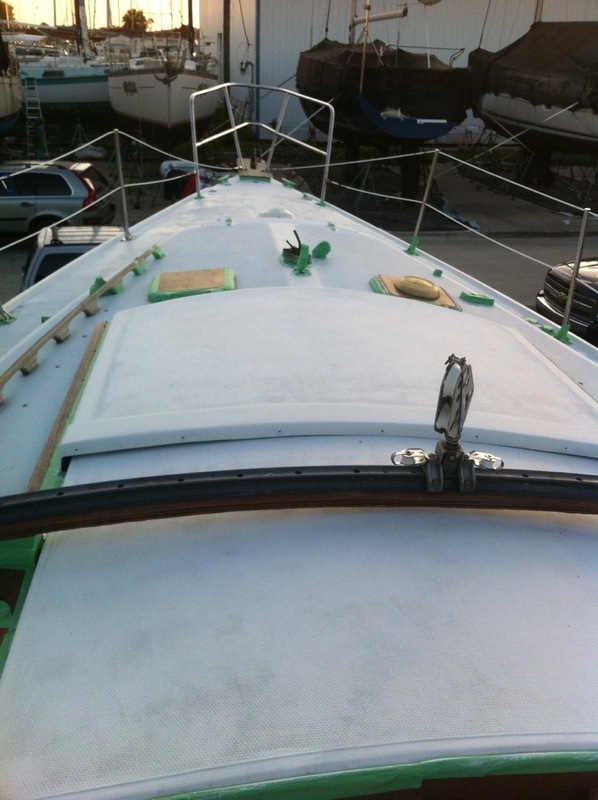 At about 9:30 or 10:00 the deck had dried enough to start prep work for primer. First order of business was silicone removal. As a rule silicone on a boat is a bad idea. It is messy. It inhibits the adhesion of paint. It looks bad and generally tends to fail fairly quickly. Butyl tape under fittings is the generally accepted way to seal for leaks. One of the many previous owners of the Genji had seen fit to seal leaks with silicone and the made sure to exhaust at least one entire tube. Our weapons of choice against the dread silicone. Lori and I spent the a good 8 to 10 man hours removing silicone. Not starting to tape until after 3 in the afternoon. Uggg. Here are some pictures of our work along the way. 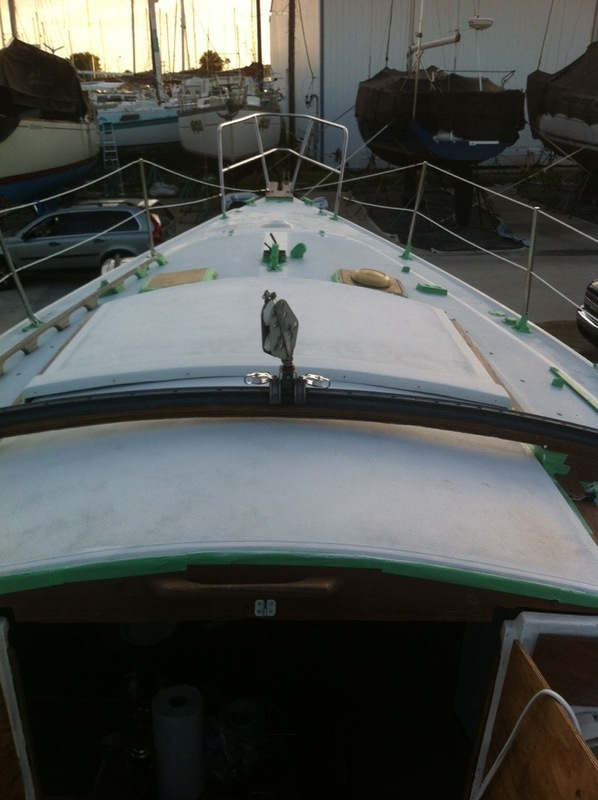 We got done right as the sun set, having taped and primed all of the boat forward of the cockpit. A note about our neighbor Duke. He is a nice older gentleman who really took a shine to Lori. 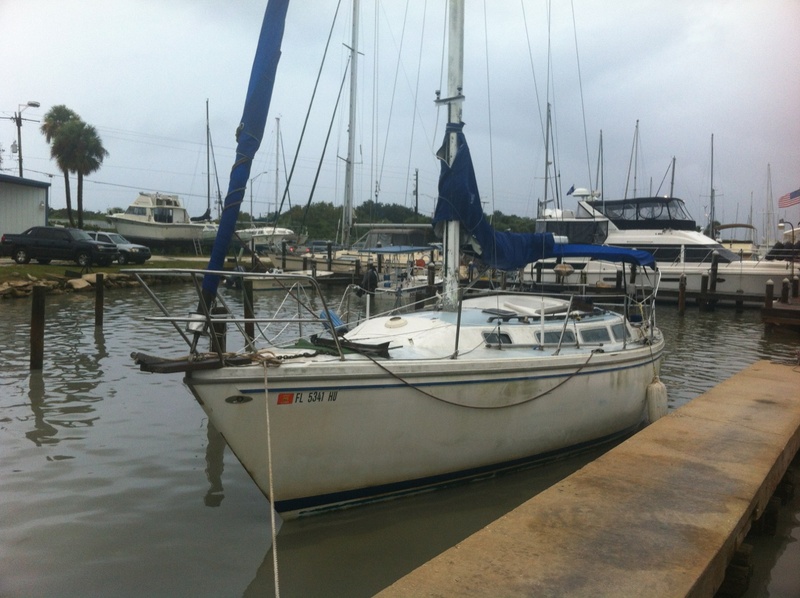 He had recently (last week) purchased the Voyager 26 that is on stands next to our boat. A very nice looking and seaworthy craft sporting a full keel. He painted the bottom green this weekend and she looks sharp. I find myself regretting not snapping a photo of his boat before we left as he plans to sail her north with his grandson before we get back out to work on Genji. Genji on the hard. It kinda burns. We got up this morning after a good nights sleep and headed for Westland. She is pretty dirty but not in that bad of shape. She does have a slight “Catalina Smile”. Lori and I went to work. The first order of business was derigging everything and taking the boom and sails off the boat. After that we started to clean. At the mast step we were greeted with 30+ years of bird droppings. Once with a hose, once with a scrub brush and soapy water and a final time with our special blue acid wash which kinda burns when on you bare skin. More work to look forward to in the morning. Here is my list from a few weeks ago revisited. 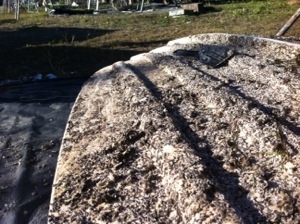 Diesel tank- 10 gallons of old diesel and most likely tree growth in a 20 gallon tank. 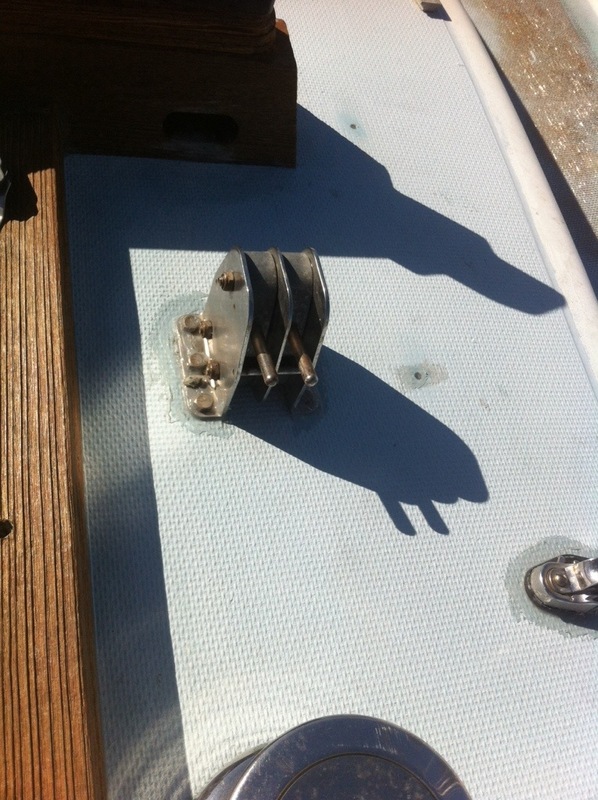 Thru hulls- mostly good, 1 needs a new valve and another may need complete replacement. Anemometer- Going to scrap and do without, may get a handheld. 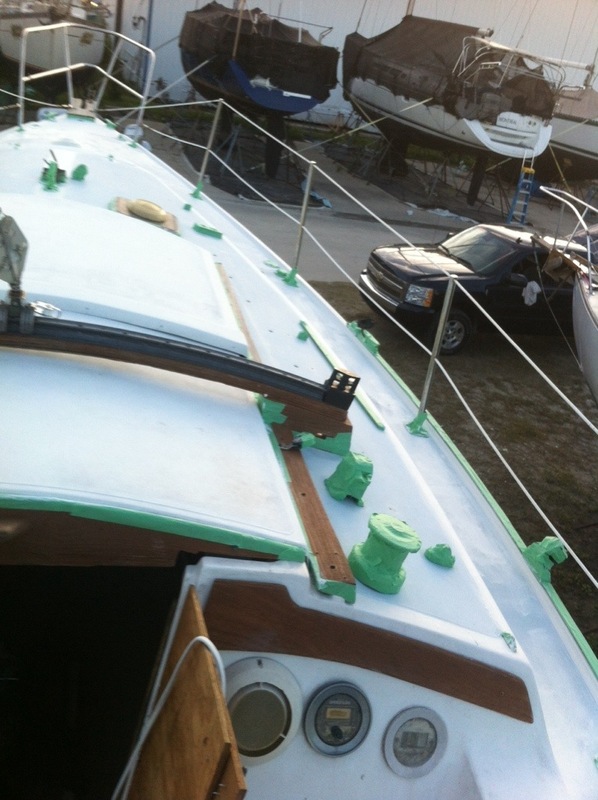 Automatic bilge n buzzer- temp bilge pump in place with parts for permanent on hand, just have to spend the time. Still thinking about the buzzer. 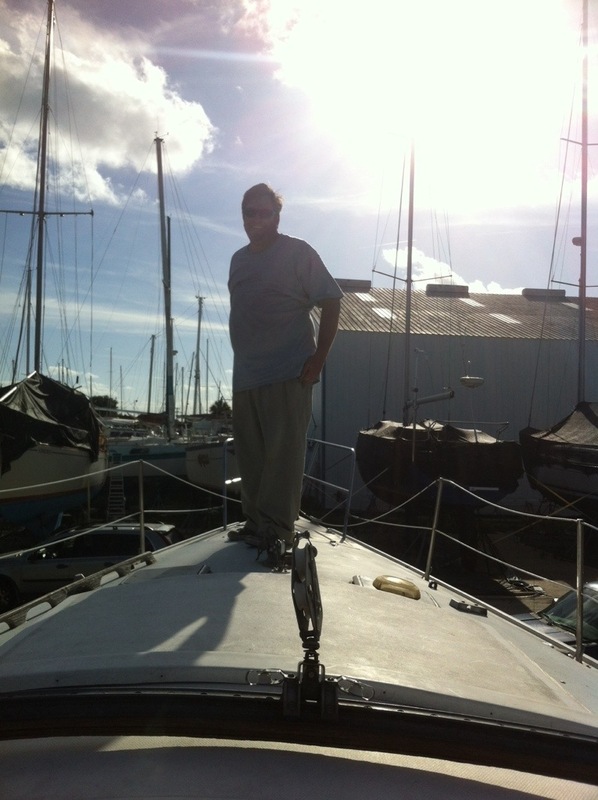 Rigging(standing and running)- Mast unstepped, obtaining price quotes for new spreader, will have boat re-rigged. 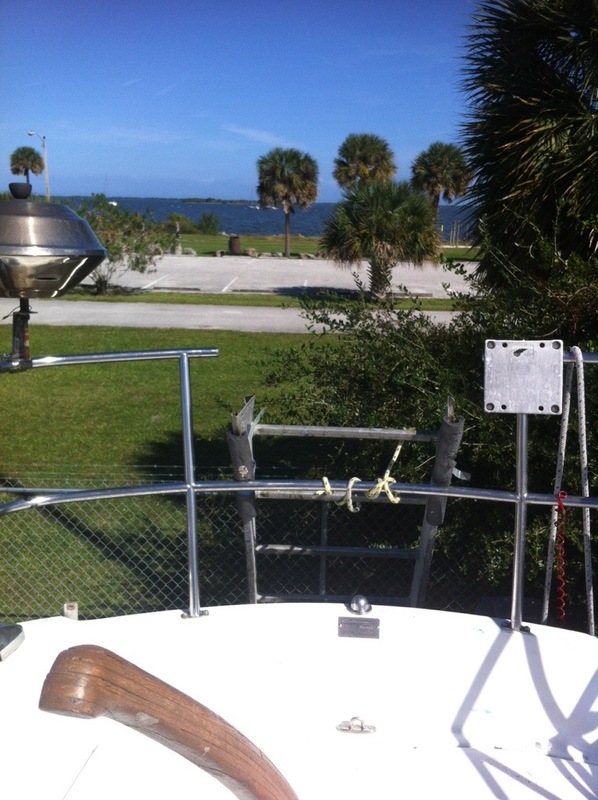 Interior lights-All fixtures rewired with proper marine cable and 2 fixtures replaced with new. LED bulbs replacements ordered for all interior lights. Genji’s Last Trip, our Exciting Sunday and the last day in the water. The puppy allowed us to sleep in Sunday morning. Not getting us up until 6:30 am that was actually 7:30 thanks to the time change. I got 2 hours more sleep than normal. 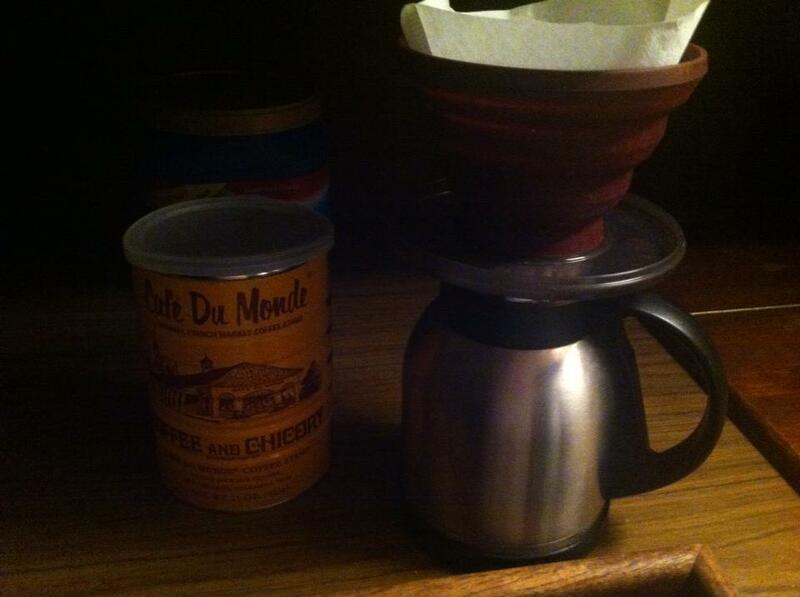 I spent the morning enjoying a cup of Chicory coffee. We took the Genji out of the slip for the first time. A quick jaunt over to C dock to clean out the holding tank before the scheduled pull out. It was very windy and since it was our first time out of the slip reversing up the fairway towards more open water was in order. Unlucky for us the outboard bracket has no tension control so the motor tiller had to be worked in addition to the boats rudder. Suffice it to say it was difficult going with the motor flopping port and starboard and the boats rudder doing the same with the added joy of the outboard being off center. We managed to get out in front of C dock before the motor called it quits. 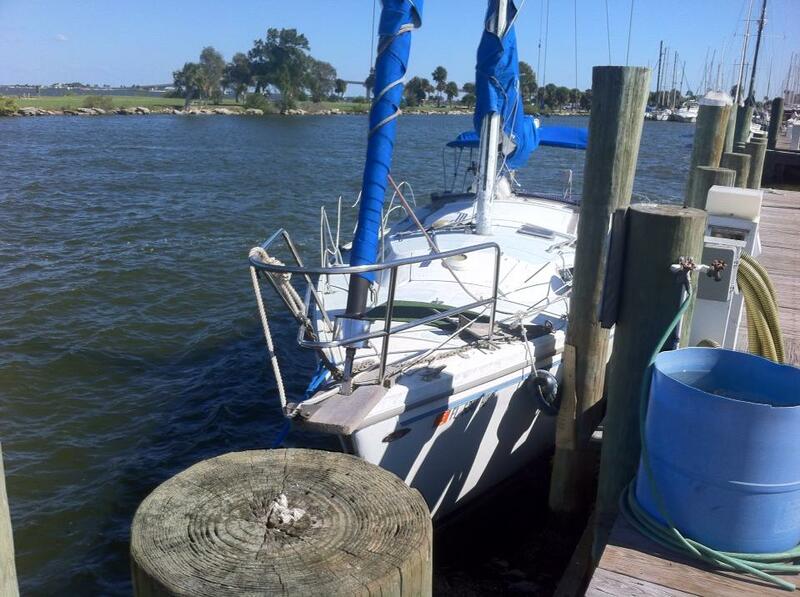 I could not get it to restart and the wind pushed us into the dock. A bit of a bump but we were at our destination. The good ship Genji got pumped out and there was matter to pump so the expedition was a good call. After cleaning out we placed a call to SeaTow for a tow back to our slip as the motor had given up the ghost. Probably an issue with bad gas and a dirty float. 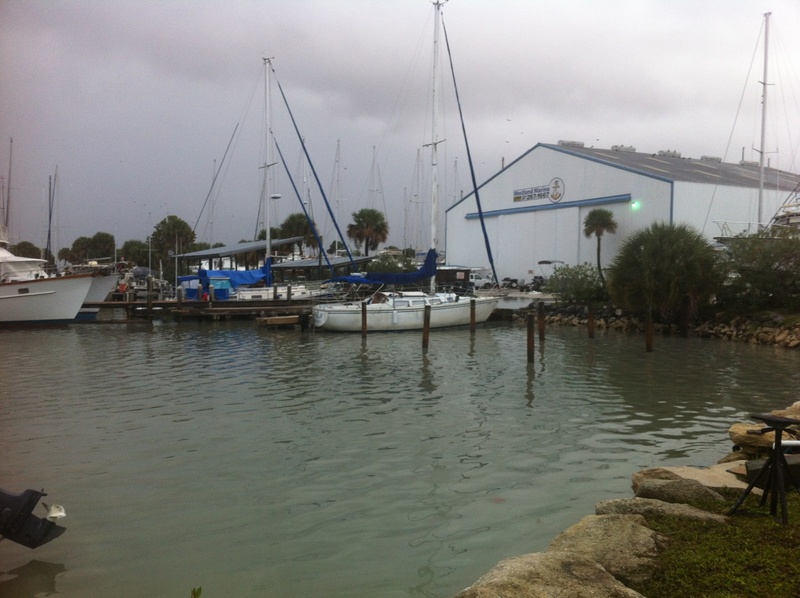 It took them an hour to arrive and then we were presented with the option of getting towed to Westland Marina where we had a scheduled appointment for a haul out or back to our slip at the Municipal marina. We opted for Westland. With some excitement and difficulty the tow service moved us to a slip at Westland and we filled out our paperwork. We were told that if we had not had a membership the tow would have been $900, but since we were members it was free. 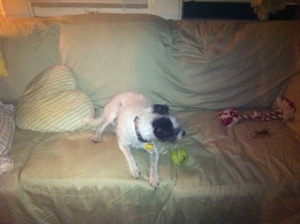 Yay us..
Today we went to the marina and filled out all the paperwork to get Genji hauled in the morning. 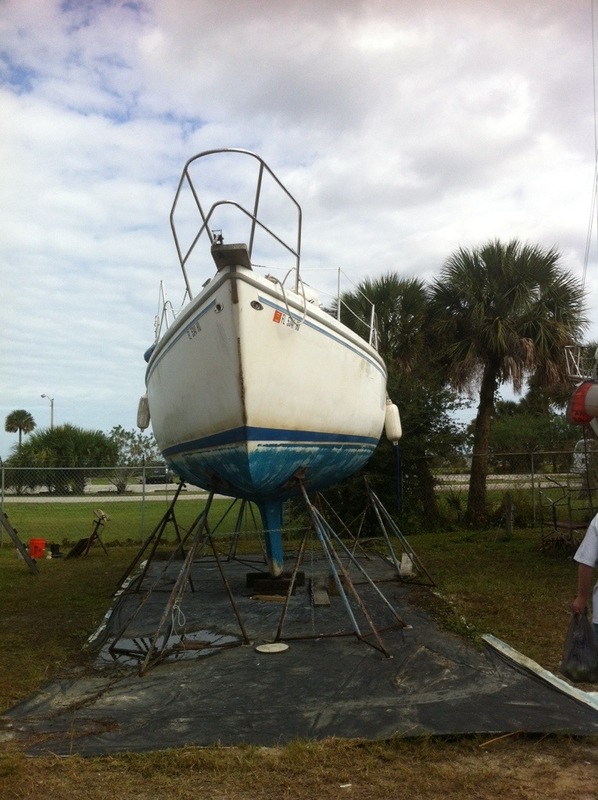 She will have her mast unstepped and put up on a rack. 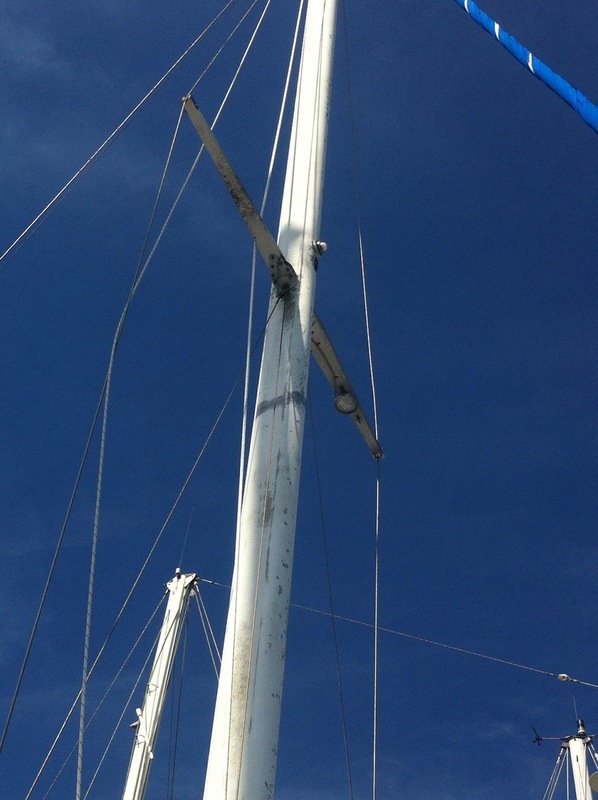 Her boom will be left on deck with her main sail and her jib stowed below. 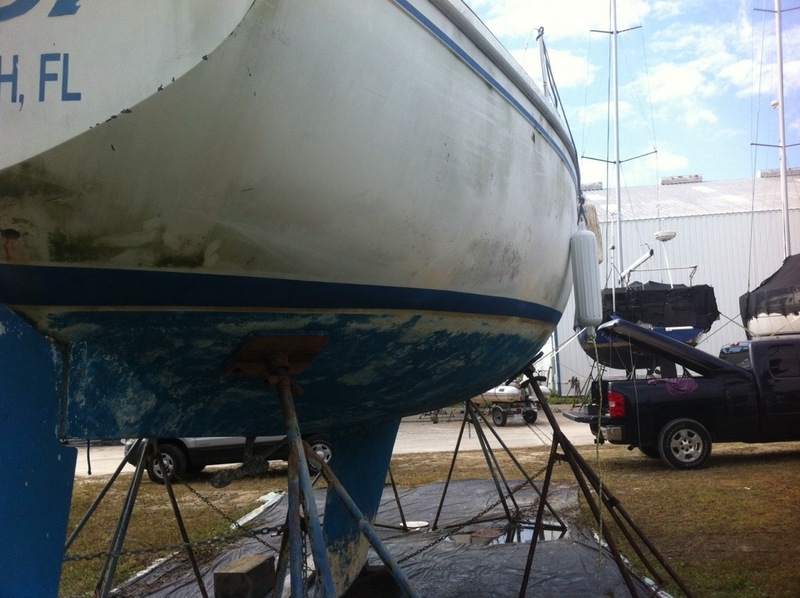 Her bottom will be pressure washed and cleaned before she is put in her new spot on stands. Then the work really begins. 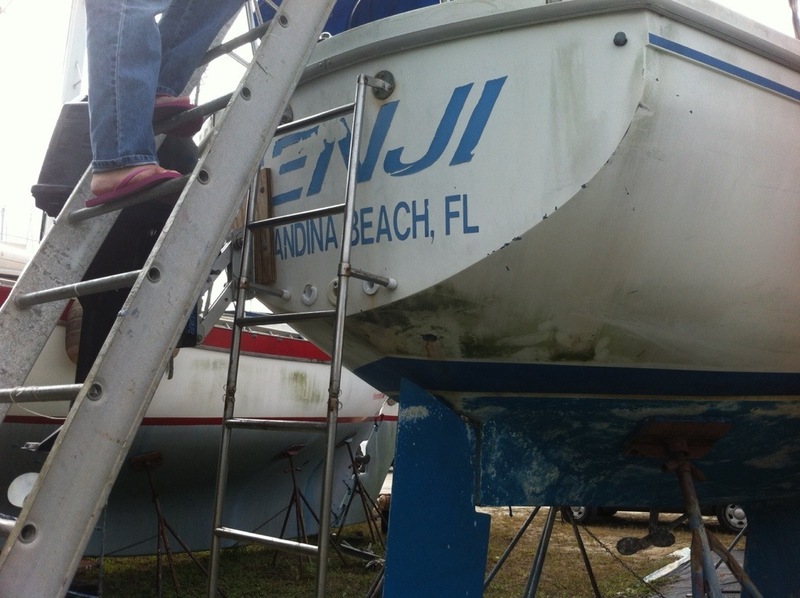 Here are some photos of her on her last day in the water as Genji, she will be Lori Bell before she floats again. It was raining today, appropriate for the occasion. War of the roaches & the joys of running wire. 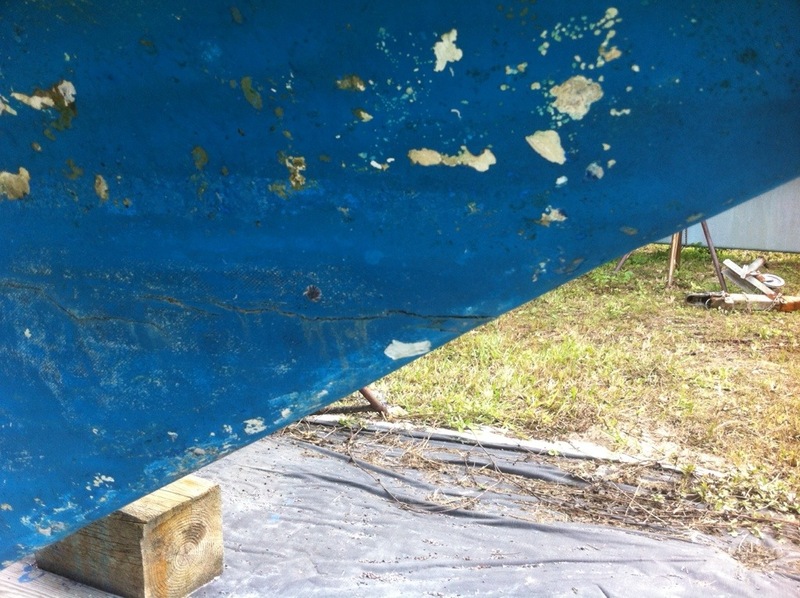 One thing a person does not think of when purchasing an old boat is the possibility of infestation. We noticed a roach issue our first weekend. 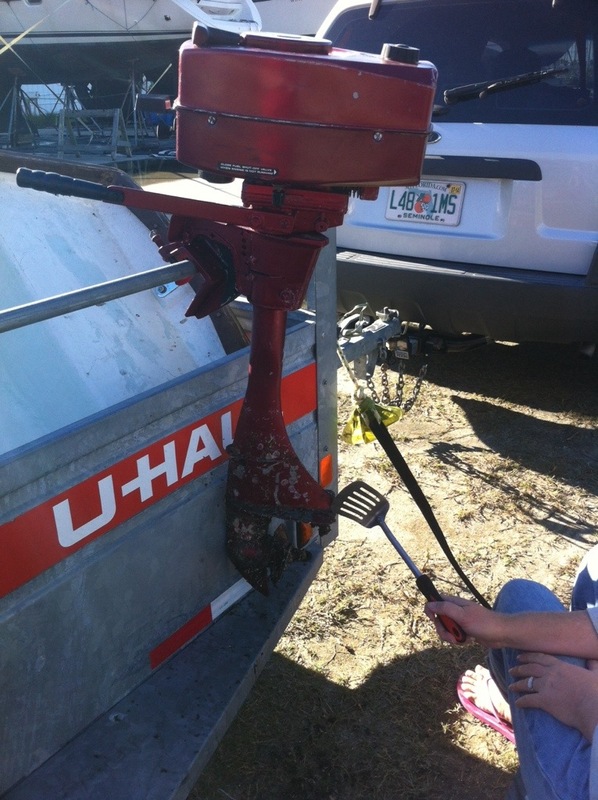 As a result we seeded the boat with Combat Roach Bait last weekend. When we returned this weekend the Bell resembled a literal combat zone. Dead roaches everywhere. Roaches on the counters, on the sole, in the bilge, on the shelves, all dead. Amazingly effective bait. Last weekend I rewired the breaker/fuse panels and Navigation station. This week I took to sorting out the interior lighting. 3 of the remaining interior lights were still using factory wire. These fixtures were dim and prone to flickering. Investigating the issues I discover they were on average only getting 6 volt +\- a bit. The factory wire being buried in the ceiling is going bad. I spent 5 hours today rewiring every interior light fixture. Now the factory wire has been abandoned. 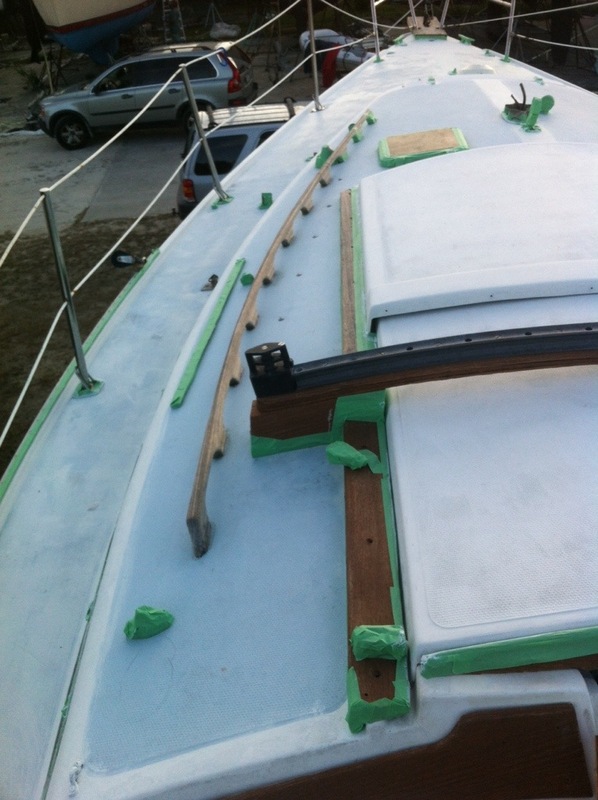 It is looking as though we will be replacing every factory wire on the boat. Time to order a few more spools. Also today we replaced the fresh water pressure pump. I wired it to the breaker panel and hit the switch, no water. Hmm, maybe we are empty. I decided to top off the tank and find out. 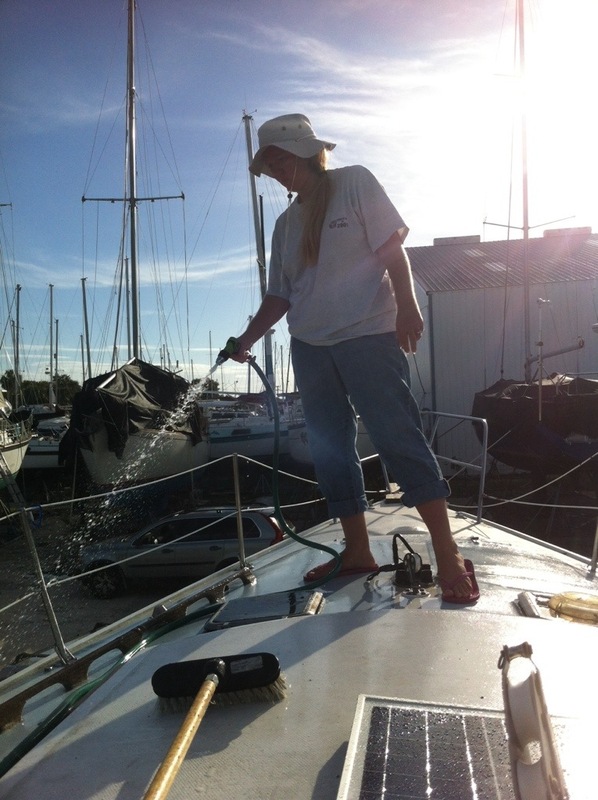 Hauled out the hose and hooked the boat to the spigot and started to fill her up. After a moment I went below and tried the pump. Still no water. Pulled the hose off the inlet and sure enough water. Checked the input voltage with my meter. None. Ugg I had missed something. I pulled open the breaker panel and sure enough I had wired the pump not to the water system switch but to the spreader light switch. Turned the new switch on and sure enough running water out of the tap. Nothing a little label maker work will not fix. After letting the water run a for a few minutes and labeling a bunch of items I turned off the tap and the fresh water pump shut off, working perfectly. Just at that moment I realized the bilge pump was running. 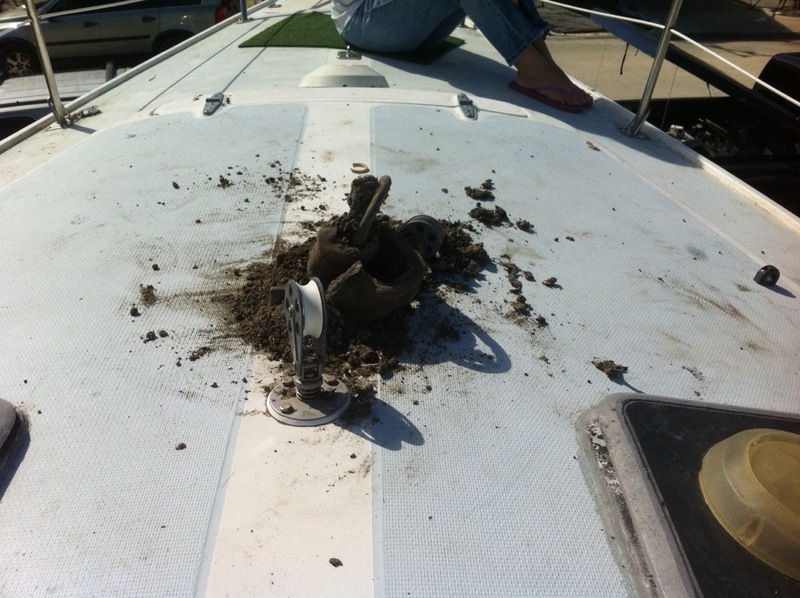 I had forgotten the fill hose and water tanks had long since filled up and water was pouring into the boat through a damages vent line. 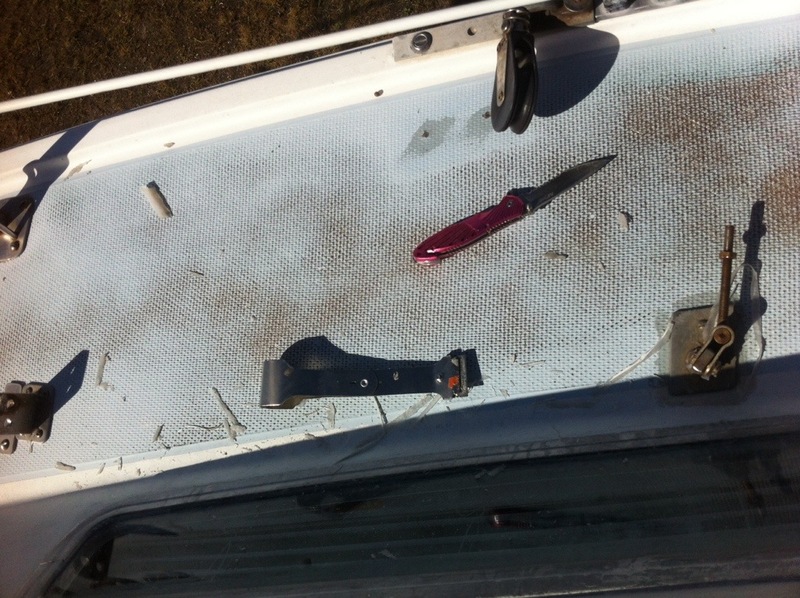 The compartment under the Vberth had about 6″ of water that was overflowing into the bilge. Good thing I fixed that pump last week. Luck for me Lori was at the marina swap meet, so no witness to my filling the boat with water.